Even the polar vortex couldn’t stop me from playing for this event! It also didn’t stop the amazing artists at the FLOAT Convention from creating a stunning setting for their awards night. 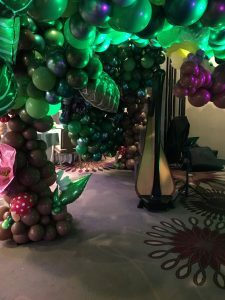 This banquet was the final event for their convention, and guests entered the ballroom at the St. Louis Airport Marriott through a rainforest – created entirely of balloons! 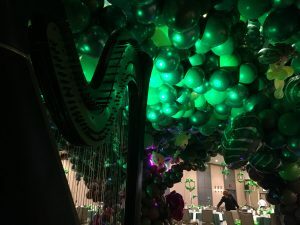 The harp was set up inside, and I played throughout dinner. 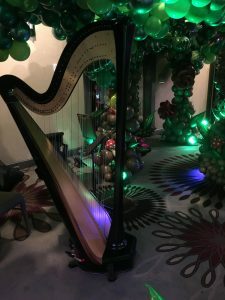 To match the enchanted garden theme, I played a selection of French classical music, “harp-y” music with lots of glissandos, and some familiar love songs. And when someone requests “Stairway to Heaven,” I’ll play it! I know people think it’s a joke to ask, but I’m always ready to play a little Led Zeppelin! I play for all types of events in the St. Louis metro area, from trade shows to weddings. Visit my website for more information: St. Louis Harpist. This entry was posted in Corporate Events and tagged awards night, convention, corporate, marriott st. louis airport, missouri, penti, st. louis. Bookmark the permalink.